Zappos CEO Tony Hsieh once estimated that bad hires had cost his firm company “well over $100 million”. Almost half of hiring/HR managers (41%) believe that bad hires have cost their firms “thousands” and the U.S. Department of Labour puts the price of a bad hire at least 30% of the employee’s first-year earning. However, beyond the impact that a bad hire has on the financial balance sheet there are more tangible, immediate effects. A bad hire can impact productivity, morale and the reputation of your firm. So you get in a recruitment firm. And bad hires still happen. This was the case for a new client recently who challenged me to demonstrate how I will be different from “all the rest”. These are the seven points I made that morning, seven firm commitments to ensure that I’d be a strategic recruitment partner rather than a service provider who would take a fee and run. I recall a client calling periodically across the day (it felt like every hour) chasing to see how we were doing filling a specialist IT role at her firm. In the end, it took a couple of days longer than usual but through a carefully targeted social media campaign, we were able to promote a candidate as the perfect fit. The truth is that we could have easily put forward a ‘best fit solution’ from our database of previously interviewed talent but to me, that wasn’t good enough, in spite of the regular calls! When I make a recommendation, I am mindful of the cost of a bad hire to both the company with the vacancy and the candidate. I also feel that it is my reputation that is on the line. If I make a ‘best fit’ recommendation because the client is getting impatient or a candidate is especially pushy and it goes wrong, the chances of the client trusting me in the future are diminished. I also make sure that I am clear about why I am putting them forward. My friend, who was part of a hiring team considering candidate recommendations, asked the recruitment firm representative why they’d put each candidate forward. You’d expect them to be able to point to specific skills, something that stood out in the interview process or their CVs but instead, they gave a vague answer. The candidates had been selected using profiling software and very little actual human assessment had taken place. They were just the suggestions made by a computer. A recruiter should be VERY clear WHY each candidate is the right hire and be able to communicate that to their client. In 2000, Sheena Iyengar and Mark Lepper published a fascinating study about … jam. Run with me on this! Shoppers at a food hall were presented with a display table of gourmet jams. On the first day, there were 24 varieties – a lot of choices and as an extra incentive, these shoppers were given a money off voucher when they tried the jam. Another day, a similar table was set up, except this time, only 6 varieties of the jam were displayed. The larger selection attracted much more attention than the small one so you’d expect that, due to the law of averages, purchases might follow the same pattern. In fact, shoppers seeing the larger variety were one-tenth as likely to buy as those presented with just six, even with the money off voucher. Further studies have confirmed the result of the jam experiment – more choice often leads to lower customer satisfaction. It can be like this in recruitment. I have a friend who is a recruiter. The company’s USP is the volume of candidates they put forward to choose from. She recently boasted of presenting a client with twenty CVs. To me, this sounded overwhelming! I think that it’s the job of the recruiter to whittle candidates down to as low a number as possible, becoming more certain of matched criteria with every cut until you are left with the one perfect candidate. It’s fascinating to compare identikit photos published by the police with the mugshots of people eventually convicted of the crime they were investigating. The point is, it’s easy to get the wrong person when you’re relying on unreliable stimuli. It is the job of a recruiter to ensure that the picture they get from a client of the ideal candidate is as accurate and detailed as possible. Vague wish lists are a common enemy of the perfect hire. It’s up to recruiters to ask great questions that deliver a very clear picture of who you want to hire. At 9.05am on the 10th September 1984, in a laboratory in Leicester, scientist Alec Jefferies made a discovery that would change the criminal justice system. He discovered that by examining variations in a genetic code you could identify a genetic fingerprint – DNA evidence. Within half a decade, criminal prosecutions became more robust and over the next twenty years, hundreds and hundreds of prisoners were exonerated through DNA testing that proved that the police had got the wrong person. 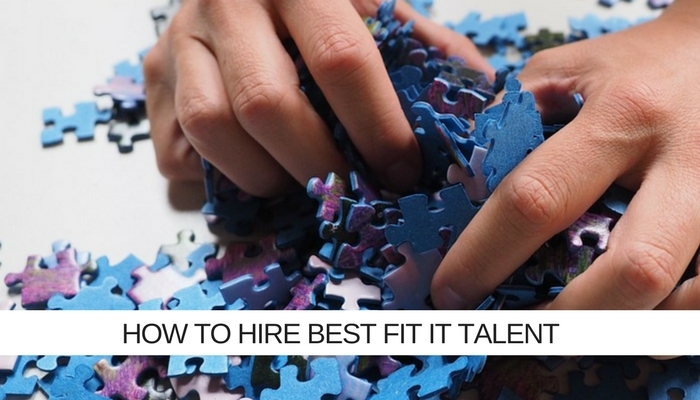 When you can identify the DNA of the perfect candidate you can go about attracting them. To not do this is like attending a networking event, gathering thirty business cards and getting back to the office and feeding them all through the shredder. The more specialist an IT role the more you need to trust that your recruitment partner has their finger on the pulse. The best way for a recruiter to do this is to meet all the best potential solutions to every potential specialist vacancy and keep a database of their contacts and availability. Everyone we interview, who stands out … we keep in touch with. We know when the contracts they’re working on are up, we know what excites and motivates them and we know what they’re capable of delivering. Matching great opportunities and great talent together doesn’t always deliver great outcomes. How many times has a seemingly good hire not delivered in the way that you’d hoped? Most times when this happens, in my view, it’s because the company culture and values and those of the candidate were not properly aligned. A recent example I recall was a project team who were in the habit of working late into the night (and weekends when needed). They hired a really talented Project Manager with a young family – the two “lifestyles” weren’t aligned. The problem often is that at an interview both hirer and candidate are wearing their Sunday best – they are projecting an image of themselves that may not necessarily be the whole truth. Having a specialist recruitment partner ‘referee’ this space can mitigate the risk of cultural misalignment. Think how recruitment usually works. You take the risk with an upfront fee and maybe you get a rebate if things don’t work out. This has always sounded a bit stacked in the recruitment firm’s favour to me. How much more focused on making sure things do work out would the recruiter be if their livelihood depended on it? There’d be less throwing CV’s at you and waiting for something to stick! Commercially, we believe in shared risk. I think that this is vital to ensuring a perfect fit, fees should be spread over equal monthly installments during a significant initial period after the hire, and by that I mean the first nine months of the candidate’s employment – three quarters of the first year! If the candidate leaves, the payments should stop. No questions asked. No retainers and no upfront costs. When your recruitment partner does this it is in their interest to ensure that your next hire is the perfect fit, the risk pendulum is more equally balanced. Reviewing a new client’s previous vacancy marketing efforts once, I asked if they had any idea who had written the job ads and role profiles. Whoever it was, it was clear that they’d had little or no experience as an IT Project Manager. When hiring specialist roles you really should seek specialists with field experience to design your recruitment process. So the least you should expect is meaningful role profiles written by subject matter experts. Beyond this, we have a two-stage interview process. Profiling conducted by experts and professionals experienced in working in the IT project management sector, people who are more empathetic to your needs. To conclude, it’s worth considering something I wrote at the start. When recruiting, especially for more specialist IT, Project or Programme Management roles, you don’t want a service provider whose interest will end on that first day the new hire clocks in. You want a strategic recruitment partner. Checking recruiters against each of these seven points should help you find one.